I was pleasantly surprised by Shazam! It wasn’t just the energetic humor or the emotional story at its heart that really stood out to me. I’m sure many people have already praised those aspects of the film. No, the best compliment I can pay Shazam! is that it doesn’t remind me of any other film I can think of. It doesn’t feel like a ripoff, homage, or any other kind of second-hand entertainment. It’s just its own thing. When I see new movies, I’m on the lookout for similarities to other films. I can’t help it. That part of my brain never shuts off. I found Bumblebee to be an enjoyable rehash of The Iron Giant. Heck, I even compared Avengers: Infinity War to the original Star Wars. Every movie I watch today feels an awful lot like older movies, as though they’re coasting on what worked in the past. So I was shocked when I saw a story unfold that was full of fun surprises and unpredictable twists. Josh Baskin isn’t able to transform into an adult or child on command. Billy Batson can. As a result, Josh can’t go home until he is able to go back to being his young self. Billy returns to his foster home and blends in throughout the film. Josh becomes a high-ranking executive at a toy company. Billy shows no such ambition. Josh’s mom desperately wants him to come home. Billy’s mom is quite the opposite. Josh can’t share his powers with others; only Zoltar can do that. Billy can and does share his powers in the most hilarious and satisfying way possible. There’s no villain with a personal stake in Josh’s life. The villain in Shazam! is most definitely invested in Billy’s fate. Josh falls in love with an adult woman. There’s no love story in Shazam! There are many other differences, but you get the point. There really is no comparison beyond both being about a boy who transforms into a grown man while retaining his childish mannerisms. I found Shazam! to be entirely unique, though. It is content to be a good film on its own terms. 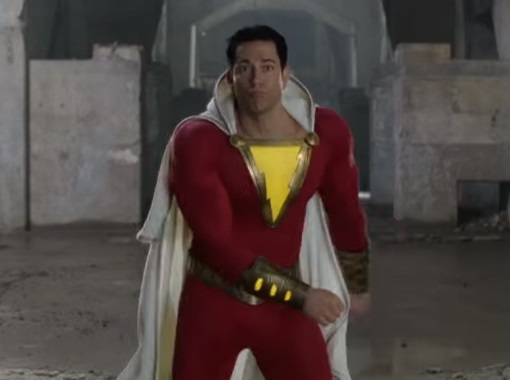 I love that Billy, whether or not he’s in the body of Shazam, never ceases to react to everything the way a child would. When he gets scared, he runs away. When he tries to act like an adult and give mature advice to people, he comes across as naïve and silly. His solution to dealing with the villain is to resort to petty name-calling – and it works! There’s never a time that I question the film’s premise or the character at its core. Everything works beautifully in this film. I’m well aware that this is the Internet, and so someone smarter than me will probably come along and tell me how foolish I am for thinking that Shazam! is an original film because obviously it borrows ideas from so-and-so movie. But even if it later comes to remind me of another film, that doesn’t take away from the initial impression it left on me that I’ve never seen anything quite like it. And that’s no easy feat, so bravo. This entry was posted in Pleasant Surprises and tagged big, comedy, comic books, dc comics, films, funny, humor, movie review, movies, shazam. Bookmark the permalink.